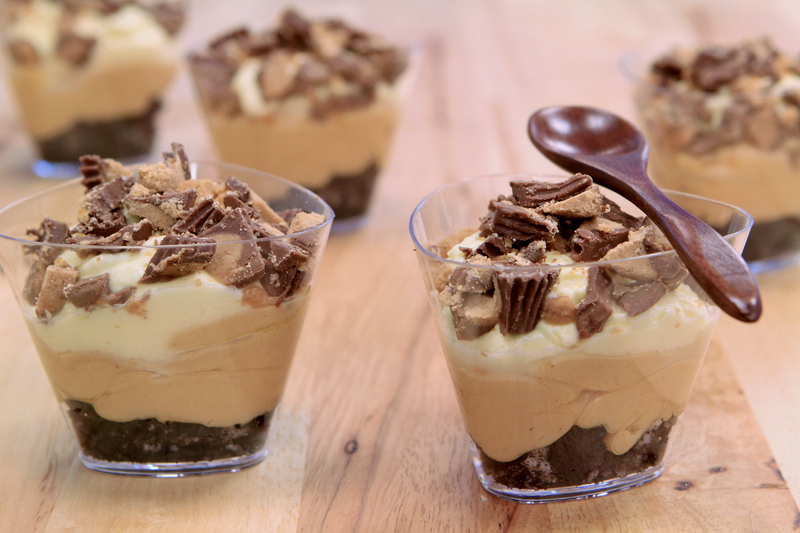 This Mini Peanut Butter Oreo Dessert is an amazingly easy no-bake dessert. Beat cream cheese until it is smooth. Make sure there are no lumps. Add 1 cup of icing sugar slowly and mix in completely. Add smooth peanut butter and mix until incorporated. Beat whipped cream until it becomes soft peak, then fold in whipping cream into the peanut butter's mixture. Place peanut butter mixture into a piping bag and pipe the filling into each mini dessert cups evenly. Or use a tablespoon to spoon the filling into the cup. Beat whipping cream until it becomes soft peaks. Continue beating whipped cream until it becomes stiff peaks. Place cream into a piping bag and pipe into the cups. Or use tablespoon to spoon the cream into the cup. Chop Reese Peanut Butter Cups and sprinkle the candy over the whipped cream. Keep these mini desserts in the refrigerator until you are ready to serve them.